Previous targeting experiments within the IgH locus have shown that V(D)J recombination was affected by an insertion of a neo gene within Eμ upstream of the core enhancer, but not by insertions downstream of the enhancer. Similarly, class switch recombination to a given (C) gene was affected only by interposition of neo in between that gene and the 3′ IgH enhancers. Here we show that insertion of neo upstream Eμ only marginally impairs V(D)J recombination, but results in an altered D and JH gene usage and completely blocks transcription of the germline JH region and the rearranged VDJ segments. Although transcriptional silencing of JH occurs upstream of the insertion and results in the lack of mature B cells in homozygous mutant animals, IgH transcription is maintained downstream of the insertion together with neo transcription and can be up-regulated by LPS stimulation or upon fusion with plasmacytoma cells. Altogether these data argue for a polarized “neo effect” involving promoter competition and further show that V(D)J rearrangement can be uncoupled from transcription. Along the B cell differentiation pathway, transcription and rearrangements of the IgH locus are precisely regulated by multiple elements with overlapping functions. Germline transcription of Cμ, completion of VDJ rearrangements, expression of rearranged μ genes, and opening of the Sμ region to class switch recombination mainly rely on upstream regulatory elements such as VH promoters, the DQ52 promoter/enhancer, and the Eμ intronic promoter/enhancer (1, 2). In addition to upstream elements, the 3′ IgH locus control region may partially control the level of expression of assembled VDJ genes and principally regulates their further recombination to downstream constant genes (3, 4, 5, 6). Within the Eμ enhancer, the core element was shown to be necessary for complete V(D)J rearrangement and expression of the locus, while its flanking 5′ and 3′ matrix-associated region (MAR)3 were dispensable (7). By contrast, partial DJ rearrangements persisted even upon deletion of the whole enhancer (8, 9). Several targeted insertions of a neomycin (neo) resistance cassette in the JH-Cμ intron resulted in complex phenotypes, which accommodate the idea that insertions downstream to Eμ do not significantly affect IgH recombination and expression (9, 10). By contrast, a neo insertion within Eμ, in between the 5′ MAR and the core enhancer, disrupted the architecture of the intronic enhancer and altered both accessibility to V(D)J recombination and germline JH transcription (9). These alterations were reported in heterozygous mutant B cells from chimeric mice, but not from homozygous mutant animals (9). In addition, it was not clear whether this phenotype mainly resulted from the neo insertion or from disruption of the architecture of the enhancer element. The analysis of neo insertions may greatly aid in understanding how multigene loci are regulated and how a limited number of enhancer elements manage to cooperate with multiple promoters. We therefore introduced a mutation by which the Eμ element and its flanking MARs remain intact, whereas a thymidine kinase (tk) promoter-driven neo gene is inserted in between the JH4 segment and Eμ. We then checked whether the inserted gene and its promoter were able to modify accessibility of the JH region to recombination and/or IgH locus transcription. Plasmid pUC18-JH, containing a 6.1-kb EcoRI genomic fragment of the mouse IgH locus, was digested with NaeI, and a neomycin resistance gene (hsvTK-neor), flanked by loxP sites, was inserted (see map on Fig. 1⇓A). The construct was linearized before transfection using the unique pUC-derived NdeI site. Cells of the embryonic stem (ES) cell line CK35 (provided by Dr. C. Kress, Institut Pasteur, Paris, France) were transfected by electroporation and selected using G418 (400 μg/ml). BamHI restriction and Southern blot analysis with an external 3′ probe (CH1 μ probe, a 0.4-kb BglII-BamHI genomic fragment) identified recombinant clones showing homologous recombination (Fig. 1⇓B). Two ES cell clones were injected into C57BL/6 blastocysts, and the resulting male chimeras were mated with C57BL/6 females. Germline transmission was assessed by coat color, and the presence of the tk-neor knockin IgH allele was checked by Southern blot and PCR (Fig. 1⇓C). In parallel, mutant homozygous mice were mated with EIIa-Cre transgenic mice (a gift from Dr. H. Westphal, used under a noncommercial research license agreement from DuPont, Wilmington, DE) (11). The progeny were checked by PCR (NaeI PCR and neo PCR (32 cycles at 55°C) as shown in Fig. 1⇓C) for the occurrence of a Cre-mediated deletion, and this was confirmed by Southern blot, yielding a 10.5-kb BamHI band (positive by the neo PCR) for the neo knockin and a 9-kb BamHI band (negative by the neo PCR and showing a knockin loxP element by the NaeI PCR) for the Cre-deleted allele (Fig. 1⇓, B and C). In the NaeI PCR, the amplified product goes from 152 (wt) to 367 bp (Δ/Δ) due to the presence of the loxP site and flanking polylinker regions from the targeting plasmid. Gene targeting. A, Map of the IgH DQ52/JH/Cμ region in its germline configuration and after neo knockin/Cre-lox recombination; probes used for Southern blotting are shown. Restriction sites: H, HindIII; S, SacI; M, MspI; A, ApaI; B, BamHI; N, NaeI; Bg, BglII. The arrow indicates the transcriptional orientation of neo. B, Southern blot of knockin ES cells carrying the JH-neo-Eμ insertion. The CH1 μ 3′ probe detects a 9.0-kb BamHI wt band and a 10.5-kb band from the targeted locus. C, PCR analysis of mice with either germline transmission of the knockin neo gene or Cre-lox recombination. Single-cell suspensions from peripheral blood or lymphoid tissues were washed in PBS/5% FCS and stained (5 × 105 cells/assay) with various Abs: anti-B220 conjugated with SpectralRed, anti-c-Kit, and anti-CD43 (BD Biosciences, Heidelberg, Germany) and anti-CD25 (Beckman Coulter, Brea, CA) conjugated with PE; anti-IgM conjugated with FITC (Jackson ImmunoResearch, West Grove, PA); and anti-IgMa conjugated with FITC (a gift from Dr. C. Berek, University of Berlin, Berlin, Germany). Cells were analyzed on a Coulter XL apparatus (Beckman Coulter, Fullerton, CA). Single-cell suspensions of spleen cells were cultured 4–5 days at 6 × 105 cells/ml in RPMI medium supplemented with 10% FCS and 20 μg/ml LPS. Sera from heterozygous mutant mice, homozygous mutant mice, and normal littermates were analyzed for the presence of the various Ig classes and subclasses by ELISA. All Ig evaluations were performed in duplicate. ELISAs were performed in polycarbonate 96-multiwell plates (Maxisorb; Nunc, Roskilde, Denmark), coated overnight at 4°C (100 μl/well) with suitable capture Abs diluted in 0.05 M sodium bicarbonate buffer (2 μg/ml for IgM, IgG1, IgG2a, and IgG2b; 3 μg/ml for IgG3; and 4 μg/ml for IgE and IgA). After blocking and washing steps, 50 μl of sera (first diluted to 1/50) or isotypic standard Ig were diluted into successive wells in 1% BSA/PBS buffer and incubated for 2 h at 37°C. The mouse standard panel included antisera specific for IgM, IgG1, IgG2a, IgG2b, IgG3, and IgA (Southern Biotechnologies, Birmingham, AL) and for IgE (BD PharMingen, San Diego, CA). After washing, 100 μl/well appropriate conjugated Abs diluted in PBS were added and adsorbed during 1.5 h at 37°C. 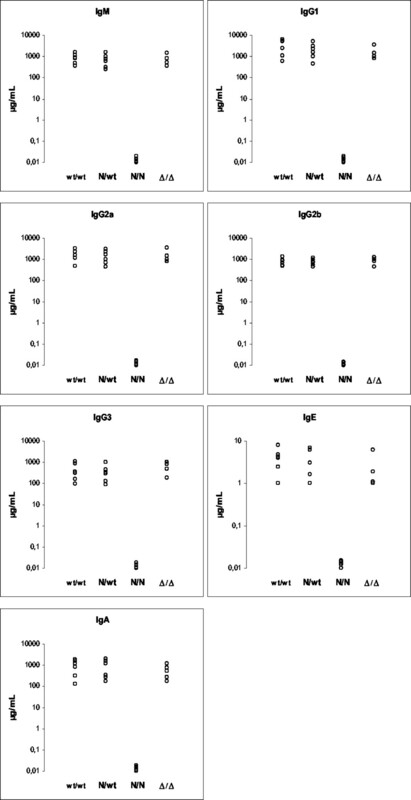 Alkaline phosphatase-conjugated goat antisera specific for mouse Ig classes (Southern Biotechnologies) were used in 0.1% Tween 20/PBS buffer, either at 1 μg/ml for IgM, IgG1, IgG2a, IgG2b, and IgG3 or at 2 μg/ml for IgE and IgA. After washing, phosphatase alkaline activity was assayed on 1 mg/ml alkaline phosphatase substrate (Sigma-Aldrich, St. Louis, MO) and blocked with addition of 3 M NaOH; optic density was measured at 400 nm in a Spectracount photometer (Packard, Meriden, CT). Splenic B lymphoblasts from heterozygous mice and myeloma cells were mixed (ratio 3/1) by adding the appropriate volume of myeloma cell suspension to the lymphoblasts as previously described (12). The cell pellet was loosened. The following steps were performed at 37°C. One milliliter of PEG-1500 solution (Roche, Mannheim, Germany) was added dropwise. Then serum-free medium was slowly added during 5 min; the suspension was incubated for a further 5 min at 37°C and was centrifuged. The supernatant was discarded, and the cells were resuspended in prewarmed selection medium: RPMI 1640, 20% FCS, 100 μM hypoxanthine, 1 μg/ml azaserine, 150 μg/ml oxalacetate, 50 μg/ml pyruvate, and 8.2 μg/ml insulin (Sigma-Aldrich). The fusion was distributed onto 96-well plates prepared with peritoneal macrophages that had been isolated 3 days previously from an unimmunized mouse and seeded at ∼6 × 104 cells/well in selection medium. Selection took place over at least 10 days. The Southern blot strategy described by Chen et al. (9) was used to score DH-JH recombination. Hybridoma DNA was digested by SstI and transferred on nylon sheets (Amersham, Little Chalfont, U.K.). Blots were hybridized with two probes, as shown in Fig. 1⇑A (neo probe, a 1.0-kb EcoRI fragment encompassing the neo-coding region; DJ-IVS probe, a 380-bp ApaI/SstI genomic fragment located within the DQ52/JH1 intervening sequence). For analysis of VDJ recombination, bone marrow DNA from homozygous and heterozygous mutant mice was analyzed by PCR (35 cycles at 60°C) with consensus forward primers specific for the VHJ558 and VH7183 gene families. Backward primer N3 was complementary to the neo gene and thus specifically amplified rearrangements on the neo knockin allele. Amplified products (expected sizes ranking from 450-1900 bp for VDJH4 to VDJH1) were cloned into the TopoI vector (Invitrogen, Groningen, The Netherlands) and sequenced. Alternatively, a J4 primer (complementary to sequence 44–66 bp downstream JH4) simultaneously amplified rearrangements of various JH segments on both wild-type and mutated alleles. For Northern blots, total bone marrow and spleen RNA was prepared using TriPure (Roche, Mannheim, Germany). Northern blotting was conducted by migrating 10 μg of total RNA on a 1% agarose denaturing gel, followed by transfer on nylon sheets (Amersham). The probes used for hybridization were the following: for Cμ transcripts, a 1.2-kb XbaI-HindIII genomic fragment containing the murine Cμ1 to Cμ3 region; for actin transcripts, a 0.45-kb genomic fragment containing exons 4 and 5; and for neo transcripts, the 1.0-kb fragment encompassing the neo-coding sequence. RT-PCR was conducted on DNase I (Invitrogen)-treated RNA and was checked to be negative in the absence of RT to rule out contamination by genomic DNA. RT was conducted for 1 h with Superscript II (Invitrogen), starting with 1 μg of total RNA. For germline transcripts, amplification was performed for 32 cycles, hybridization was at 55°C for Iμ transcripts (Iμ/Cμ primers; expected size, 245 bp for amplified products), for germline DQ52 transcripts (GL DQ52/Cμ primers; expected size, 784 bp; hybridizing with the DJ-IVS probe), for VHJ558 germline transcripts (VHJ558/VHRT primers; expected size, 286 bp; hybridizing with a VHJ558 probe), for VH7183 germline transcripts (VH7183a/VH7183 RT primers; expected size, 185 bp; hybridizing with a VH7183 probe), and for VHS107 germline transcripts (VHS107/VHS107 RT primers; expected size, 250 bp; hybridizing with a VHS107 probe). PCR was performed with hybridization at 57°C for rearranged mature VHJ558DJ-Cμ transcripts (VHJ558/Cμ primers; expected size, ∼365 bp) and for rearranged mature VH7183DJ-Cμ transcripts (VH7183b/Cμ primers; expected size, ∼175 bp), at 56°C for rearranged primary VHJ558-JH2 transcripts (VHJ558-J2 primers; expected size, ∼340 bp) and for rearranged primary VH7183-JH2 transcripts (VH7183b/J2 primers; expected size, ∼150 bp), and at 59°C for rearranged primary VHJ558-JH3 transcripts (VHJ558/J3 primers; expected size, ∼400 bp; hybridizing with a 850-bp BamHI-NaeI probe encompassing JH3 and JH4) and for rearranged primary VH7183-JH3 transcripts (VH7183b/J3 primers; expected size, ∼210 bp, hybridizing with the same probe encompassing JH3 and JH4). PCR was performed with hybridization at 55°C for neo transcripts (N1/N2 primers; expected size, 335 bp) and at 50°C for β-actin (Acti4/Acti5 primers; expected size, 260 bp corresponding to spliced transcripts from exons 3 and 4 of the β-actin gene) used as an internal control. Five individual hybridomas were first identified by Southern blot (see above) as carrying a germline JH/neo knockin allele. Genomic DNA was restricted to completion with HindIII and then submitted to a second digestion with either MspI or HpaII. After Southern blotting, nylon filters were hybridized with the DJ-IVS probe. A methylated pattern was characterized by the presence on an uncut 2240-bp HindIII band after HpaII restriction. 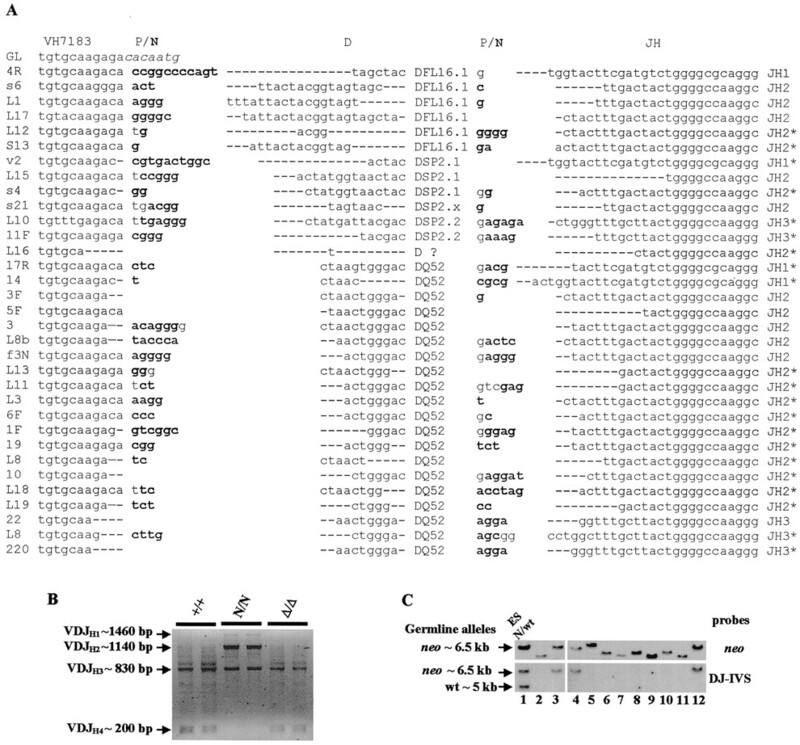 The abundance of VDJ rearrangements on both alleles among wt/Δ splenocytes was estimated by comparing VDJH4 segments with two different sizes amplified from both alleles. The VH7183b-3′NaeI PCR (32 cycles at 59°C) strategy used for this assay was designed by choosing a backward primer located downstream from the NaeI site normally located 200 bp downstream from JH4. The presence of a knockin loxP element resulted in a 515-bp amplified fragment instead of 300 bp for rearrangements of the wild-type allele. The following primers were used: 5′ NaeI, 5′-TCAGGTAAGAATGGCCTCTCC-3′; 3′ NaeI, 5′-TCCTAAAGGCTCTGAGATCCC-3′; Iμ, 5′-CTCTGGCCCTGCTTATGTTTG-3′; Cμ, 5′-GAAGACATTTGGGAAGGACTGACT-3′; VHJ558, 5′-CTSAGCTKGTKARSCCTGGGGCTT-3′; VHRT, 5′-TGWGGTWSYMWCACTGTG-3′; VH7183a, 5′-CAACCATTAGTAGTGGTGGTAG-3′; VH7183b, 5′-CGGTACCAAGAASAMCCTGTWCCTGCAAATGASC-3′; VH7183RT, 5′-TTTCCTCATTGTGTCTCTTGC-3′; VHS107, 5′-CTTCTGGGTTCACCTTCAG-3′; VHS107RT, 5′-GTCCTCTCACTGTGTGCAT-3′; DHL, 5′-GGAATTCGMTTTTTGTSAAGGGATCTACTACTGTG-3′; 5′DQ52, 5′-CGGAGCACCACAGTGCAACTG-3′; GL DQ52, 5′-CAACTGGGACCACGGTG-3′; JH2, 5′-CTGTGAGAGTGGTGCCTTGG-3′; J3, 5′-GTCTAGATTCTCACAAGAGTCCGATAGACC-3′; J4, 5′-TCTGCAATGCTCAGAAAACTCC-3′; N1, 5′-GGATGATCTGGACGAAGAGCAT-3′; N2, 5′-TCCCCTCAGAAGAACTCGTCAA-3′; N3, 5′-TCTTGACGAGTTCTTCTGAGGGGATCGGCA-3′; Acti-4, 5′-TACCTCATGAAGATCCTCA-3′; and Acti-5, 5′-TTCGTGGATGCCACAGGAC-3′. Degenerate nucleotide positions are coded as follows: R = A or G, Y = C or T, S = C or G, M = A or C, and W = A or T. Primers for VHJ558, VH7183b, VHRT, DHL, and JH3 were adapted from Ref. 13 ; Iμ and Cμ primers were adapted from Ref. 14 . A gene-targeting vector was constructed to insert a neo resistance cassette at the NaeI site located 200 bp downstream from JH4 (see map in Fig. 1⇑A). The neo gene was driven by a tk promoter and was flanked by two loxP sites. This construct allowed the growth of geneticin-resistant ES cell clones. Four of 480 ES clones were selected because they gave hybridizing fragments of the size expected for the JH-neo-Eμ (N) mutation (i.e., insertion of the neo gene) by Southern blotting and hybridization with a probe located outside of the construct (Fig. 1⇑B and data not shown). Heterozygous N mutant ES clones were injected into C57L/B6 blastocysts, which were implanted into foster mothers to derive somatic chimeras. Chimeras were bred with either wild-type (wt) animals to obtain heterozygous (wt/N) F1 mice carrying the heterozygous JH-neo-Eμ mutation, or with EIIa-Cre transgenic 129sv mice (11) to yield heterozygous JH-Δneo-Eμ animals (wt/Δ) after Cre deletion of the neo gene. Further breeding coupled with PCR and Southern blot testing gave two homozygous lines of JH-neo-Eμ (N/N) and JH-Δneo-Eμ (Δ/Δ) mutant animals (Fig. 1⇑C and data not shown). Pathological studies of tissues from homozygous animals and their littermates were conducted. Spleens of reduced size devoid of any germinal centers and the absence of Peyer’s patches were noticed in N/N, but not Δ/Δ mutant, animals. By flow cytometry, Δ/Δ animals could not be distinguished from wt with regard to B cell compartments (not shown). 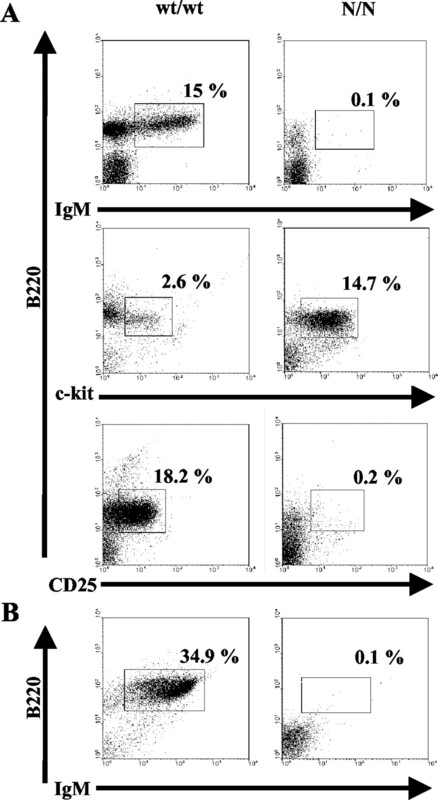 By contrast, when bone marrow from mutant N/N animals was checked by flow cytometry, double staining with anti-B220 and anti-μ antisera showed the lack of surface IgM+ B cells (Fig. 2⇓A). B cells were also absent from spleen and peripheral blood (Fig. 2⇓B and not shown). N/N bone marrow featured an expanded B220+, c-Kit+, CD43+, CD25−, sIgM− pro-B compartment, while the B220+, CD43−, CD25+ pre-B cell compartment appeared to be empty (Fig. 2⇓A and data not shown). B cell development in mutant animals. Freshly isolated bone marrow (A) and spleen (B) cells were isolated and stained with fluorescently labeled Abs. Representative results from wt/wt and N/N animals are shown. Accordingly, a complete serum IgM and IgA deficiency appeared in N/N, but not in Δ/Δ, animals (Fig. 3⇓). IgG serum levels were conserved in F2 homozygous animals born from heterozygous females due to the persistence of maternal Abs over 6 mo (data not shown); however, all serum Ig classes fell to undetectable levels in F3 animals born to homozygous F2 N/N females (Fig. 3⇓). Neo insertion thus resulted in B cell development arrest at the pro-B cell stage. ELISA analysis of Ig secretion in 8-wk-old mouse sera. Data from wt/wt control mice are shown on the left of each graph, followed by heterozygous N/wt, homozygous N/N, and Δ/Δ sera. Whether such a defect in surface IgM expression reflects the absence of productive V(D)J rearrangements or blocked transcription of the Cμ gene was first explored by RT-PCR and Northern blot analysis (Fig. 4⇓). Germline transcription is usually considered an initial landmark of accessibility of the IgH locus at the pro-B cell stage, with germline DQ52 transcripts, the so-called μO transcripts, being markers of transcriptional competence in the germline DQ52/JH region (15). Since mutant animals revealed an accumulation of cells blocked at the pro-B cell stage, the presence of IgH germline transcripts was first assayed in bone marrow from N/N animals. Iμ transcripts and germline VH (VHJ558, VH7183, and VHS107) transcripts were readily detected in homozygous N/N mutant bone marrow pro-B cells. By contrast, germline DQ52 transcripts were undetectable in all 13 homozygous mice assayed (Fig. 4⇓B and data not shown). Dμ transcripts corresponding to transcription of partial DJ rearrangements were also undetectable as both mature and primary transcripts whether they included DQ52 or D segments other than DQ52 (Fig. 4⇓B). Analysis of IgH gene transcription. A, Schematic of the IgH locus and of primers used to identify germline and rearranged gene transcripts. B, Total RNA was isolated from wt and N/N bone marrow cells. RT-PCR assessed the presence or the absence of the various germline transcripts (Iμ, VH, and DQ52), of transcripts including rearranged VDJ or DJ segments either as unspliced primary transcripts (J2 and J3 backward primers) or as mature transcripts spliced onto the Cμ CH1 exon (Cμ backward primer) and of neo transcripts. Amplification was performed as described in Materials and Methods. C, Upper panel, Northern blots showing Cμ transcription in bone marrow, with Cμ transcripts lacking in six N/N mice (Cμ1−3 probe). Lower panel, Inducibility of neo transcripts in wt/N cells stimulated with LPS or fused to plasma cells: lane 1, positive control neo-transfected cells; lane 2, wt/N ES cells; lanes 3–14, tissues from three independent wt/N mice (lanes 3–5, bone marrow; lanes 6–8, kidney; lanes 9–11, unstimulated splenocytes; lanes 12–14, splenocytes taken from a 4-day LPS stimulation); lanes 15–20, six representative hybridomas from wt/N mice. Consistent with the lack of detectable Ig production in N/N mice, both Northern blotting and RT-PCR failed to detect rearranged VHDJH transcripts, either as mature transcripts spliced onto Cμ or as primary transcripts still including the JH-Cμ intron (Fig. 4⇑, B and C). Neo transcription was detectable at a low level only by RT-PCR in bone marrow from all homozygous N/N mice and in lymphoid tissues from both homozygous and heterozygous animals (Fig. 4⇑ and data not shown). It appeared to be regulated in parallel to VDJ transcription in normal B cells, since it was induced by LPS stimulation in cultured heterozygous wt/N splenocytes, reaching a threshold of detection by Northern blot (Fig. 4⇑C). It was also up-regulated in about half the neo gene-positive wt/N hybridomas obtained by fusion with plasmacytoma cells (Fig. 4⇑). Neo transcription thus contrasted with the silencing of JH and VDJ segments. Incidentally, it also indicated that, even in heterozygous B cells expressing a wt IgH locus, the allelically excluded and targeted IgH allele had not undergone irreversible long-range inactivation and could be transcribed in activated B cells. Since both germline transcripts from the JH region (DQ52 germline transcripts) and mature V(D)J transcripts were undetectable in N/N animals, it was questionable whether the JH region was able to undergo V(D)J rearrangements in those animals. Bone marrow DNA was thus assayed to detect rearrangements of the VH7183 family gene segments on JH segments by using a PCR either amplifying any VDJ rearrangement (3′JH4 backward primer) or specific for the neo knockin allele (N3 backward primer). Complete rearrangements of the mutated allele were readily detected in both homozygous N/N and heterozygous wt/N animals at sizes corresponding only to rearrangements on JH1, JH2, and JH3; these amplified VDJ junctions were cloned and sequenced (Fig. 5⇓A). To have controls with a primer outside neo, we also assayed VDJ recombination by PCR with a backward primer located immediately downstream from JH4 that readily detected rearrangements in wt and Δ/Δ animals (Fig. 5⇓B). This assay was strongly biased toward the amplification of JH4 rearranged genes due to their much shorter size. Nevertheless in homozygous N/N animals, there was no rearrangement detectable on the JH4 segment, while amplified fragments of larger size corresponding to the upstream JH segments could be detected (Fig. 5⇓B). A bias also appeared in the use of D elements, and while at least five different D were used, including the most 5′-located segment, DFL16.1, there was a strong over-representation of DQ52 (20 cases of 33 cloned VDJ sequences; Fig. 5⇓A). The structure of VDJ junctions appeared to be grossly normal, although more than half of them were out of phase, probably due to the lack of any selection for expression of a functional protein. The presence of both P and N insertions in heterozygous animals indicated that both DJ and VD junctions happened at a cell differentiation stage where terminal deoxynucleotidyl transferase was still expressed, and altogether there was no indication of any delay in the gene rearrangement process. VDJ rearrangements in mutant animals. A, Sequences of VDJ junctions related to the VH7183 gene family on the neo knockin IgH allele, classified according to D segment usage. Dashes indicate deleted nucleotides; N insertions are in bold; nonfunctional sequences are marked by an asterisk. B, Analysis of VDJ rearrangements in representative wt/wt, N/N, and Δ/Δ animals using a VH/JH4 PCR assay (forward VH7183b and backward J4 primers). Positions of fragments amplified from each JH segment are indicated. C, Southern blot analysis of JH rearrangements in hybridomas from wt/N mice showing rearrangements on both alleles (lack of hybridization with the DJ-IVS probe plus rearranged neo band) or only on the wt allele (germline pattern with both the DJ-IVS and the neo probe). Lane 1, wt/N ES cell DNA; lanes 2–12, DNA from representative wt/N hybridomas. When individual Ig-secreting hybridomas from wt/N animals were analyzed for JH rearrangements, less than one-fifth of them (5 of 29) appeared to have kept the mutated JH allele in a germline configuration (Fig. 5⇑C). Although neither blocked nor delayed, the occurrence of a DJ rearrangement, which is usually biallelic in normal B cells, thus appeared to be less constant than normal on the knockin allele. We then checked the methylation status of the germline JH allele in the five Ig-producing heterozygous hybridomas that had kept the targeted JH allele in its germline configuration (Fig. 6⇓). By comparison to nonlymphoid cells, in which the JH region was almost completely methylated, all five hybridomas displayed a clear pattern of demethylation. Assuming that demethylation can be considered a molecular marker of DNA accessibility, the JH region thus appeared to be accessible to DNA rearrangement even in such hybridomas. Methylation status of JH in the five of 29 wt/N hybridomas that kept a germline neo knockin IgH allele. Genomic DNA was double-restricted with HindIII and MspI or HindIII and HpaII and was hybridized with the DJ-IVS probe specific for the germline DQ52-JH region. Since the isoschizomers MspI and HpaII are, respectively, methylation resistant and methylation sensitive, a methylated pattern is characterized by an intact 2240-bp band (marked by an asterisk) after HpaII restriction, as observed in nonlymphoid cells (ES cells). In homozygous Δ/Δ animals, the concentration of all Ig isotypes was normal. B cells were present at normal levels in peripheral lymphoid organs. Since modifications of gene expression simply resulting from insertion of a loxP element have been reported in some instances (16), we checked the expression and rearrangement of the loxP knockin locus in competition with a wt allele in heterozygous IgH Δ/wt animals. To that goal, heterozygous mice were selected, and alleles were compared with regard to the expression of their protein product by flow cytometry using an a allotype-specific anti-μ Ab. Splenocytes from aΔ/bwt mice were compared with those from awt/bwt control mice and were found to express similar levels of the IgMa allotype BCR (not shown). Alleles were also directly compared with regard to the frequency of rearrangements using a VH7183 consensus primer (VH7183b primer) and a PCR strategy differentiating by size rearranged fragments from the wt or the loxP allele. In all mice studied, equal amounts of rearranged fragments from both alleles were obtained (Fig. 7⇓). Absence of effect of the knockin loxP element in wt/Δ mouse splenocytes. The equal occurrence of VDJ rearrangements on both alleles is shown by comparing the relative abundance of VDJH4 segments with two different sizes amplified from both alleles in a VH7183b-3′NaeI PCR assay. The IgH genes are clustered within a well-characterized multigene locus in which multiple promoters have to be controlled by shared and distant regulatory elements. To help understand how the programmed expression of such multiple promoters is regulated, disruption of normal locus architecture can be obtained through insertion of an additional exogenous gene. The effect of neo insertions in the downstream constant part of the IgH locus has been documented in several instances and shown to affect germline transcription of and class switch recombination to constant genes located upstream from the inserted neo gene (3, 4, 6, 17). In such cases it is assumed that the inserted neo gene may somehow compete with or isolate constant gene germline I promoters from the 3′ IgH enhancers and thus compromise class switch recombination to most constant genes (with the notable exception of Cγ1) (17). By contrast, a number of neo insertions within the JH-Cμ intron had virtually no effect on either V(D)J rearrangement or IgH expression. This was especially true for neo insertions in either orientation, replacing the Cμ CH1 exon (10), as well as for a neo insertion replacing the 3′ MAR of the intronic enhancer (9). In a single case, which was also the only neo insertion reported upstream from the core Eμ, a defect affecting the IgH locus was observed (9). The mutation was studied in heterozygous mutant B cells and was shown to severely impair DJ recombination and JH region demethylation together with germline transcription. In the current study we obtained a mutation that did not alter either the Eμ enhancer by itself or its flanking MARs. However, we showed that it resulted in a complete B cell defect and blockade of Ig production in homozygous animals. That the B cell defect was only due to the neo insertion and not to any unexpected additional mutation of the IgH locus was checked by Cre deletion of neo, which restored normal B cell development and Ig production. The molecular mechanisms responsible for the blockade of B lineage differentiation at the pro-B cell stage were explored and showed that complete VDJ rearrangements of the mutant allele were readily detectable in both homozygous and heterozygousmutant bone marrow cells. These recombination events involved various V, D, and J segments, but revealed a strongly biased D and JH gene usage. There was a complete lack of rearrangement on the distal JH4 segment and use of the DQ52 element in ∼60% of cases instead of the 5–10% previously estimated for wild-type VDJ rearrangements (18). The observed JH bias is strikingly similar to the phenotype reported upon deletion of the DQ52 promoter/enhancer element (18), further suggesting that accessibility of the distal JH4 segment to recombination may rely on synergistic interactions between both Eμ and DQ52 regulatory elements. Such interactions would be disrupted in a similar manner by the DQ52 deletion or interposition of a knockin neo gene. Beside this bias, VDJ rearrangements had normal features, including N insertions, but they did not yield any mature transcripts. As a result, there was no possible selection for a functional BCR, and about two-thirds of the rearranged VDJ segments were out-of-frame. Although the mutant mice had an expanded bone marrow pro-B cell compartment, neither germline transcripts from the JH region (germline DQ52 transcripts readily detectable in normal bone marrow) nor Dμ transcripts originating from partial DJ rearrangements could be detected in homozygous mutant mice. Contrasting with the lack of any transcripts from the JH region, i.e., originating upstream from the inserted neo gene, Iμ transcripts were detectable in all mutant animals together with neo transcripts. The tk promoter usually yields constitutive low level expression in mouse cells; in heterozygous wt/N splenocytes, although by force located on the allelically excluded IgH locus, the tk-neo gene captured stimulating effects from the IgH locus and appeared to be strongly induced by LPS stimulation. Upon fusion with terminally differentiated plasma cells, some hybridoma clones also up-regulated neo transcription. It thus appears that in the present case, the so-called neo effect merely consists of promoter competition and acts in a directional way only on transcripts initiated upstream from the insertion as if interposition of the tk promoter interrupted the interactions between Eμ and adjacent upstream promoters. It is known that activation of most VH promoters requires approximation to the Eμ enhancer through VDJ rearrangement. A notable exception occurs at the pro-B cell stage, where certain VH genes, especially those belonging to the VHJ558 family, are transcribed in their germline environment (19, 20). In our homozygous mutant mice, although there was no detectable transcription of rearranged VH genes, germline transcription was maintained in bone marrow cells for unrearranged members of various VH families (including VHJ558, VH7183, and VHS107). This observation confirms that VH germline transcription probably relies on specific cis regulatory elements other than Eμ; such putative elements lying in the VH gene cluster would be silenced or deleted when B cells progress beyond the pro-B cell stage, after which germline VH transcription ceases. In the present case these elements do not appear to be affected by the neo insertion and therefore are probably independent from Eμ, a finding in agreement with their negative regulation upon B cell stimulation (19). V segments usually rearrange to transcribed DJ segments, and both transgenic studies and targeted mutations have shown that transcriptional regulatory elements are strongly involved in the lineage-specific and stage-specific regulation of V(D)J recombination (1, 2, 7, 8, 9, 18, 21, 22). However, there is no unequivocal evidence that transcription by itself is needed for VDJ recombination. Models for the regulation of accessibility to V(D)J recombination have proposed that cis regulatory elements may either directly recruit putative accessibility factors or act via transcription-related mechanisms (22). Both pathways may also be interdependent, since a number of transcription factors are known to contain or to recruit chromatin remodeling activities (23). The herein reported neo insertion thus appears to uncouple two different effects of Eμ on the JH region: induction of accessibility to recombination and induction of transcription. Although not reported in the endogenous locus, such an uncoupling has already been observed for Ig transgenes, which were either transcribed and not rearranged (21) or were able to undergo rearrangement but not transcription (24, 25, 26). While the wild-type JH region usually undergoes germline transcription before recombination, endogenous germline VH segments provide other examples of rearrangements involving untranscribed DNA regions (20). It is thus clear that germline transcription of VH segments is not a prerequisite for their accessibility to recombination. From our study the same appears to hold true for the DQ52 and JH segments. Indeed, the neo knockin IgH locus features a complete lack of transcription in the DQ52/JH region that contrasts with a high level of rearrangements involving this region in both homozygous and heterozygous mutant animals. In contrast to constant gene germline transcripts that probably play a mechanistic role in class switch recombination (reviewed in Ref. 27), VH, D, and JH germline transcripts may rather be nonmandatory by-products of accessible genes. Meanwhile, chromatin accessibility would constitute by itself a prerequisite to VDJ recombination. The high frequency of complete VDJ rearrangement maintained in our N/N mice together with demethylation of JH in the B cell lineage constitute remarkable differences with a previously studied neo insertion upstream from the core enhancer (9). In the latter case, disruption of interactions between the 5′ MAR and core Eμ probably resulted in a more drastic effect on demethylation and chromatin remodeling. Indeed, MAR regions have been shown in transgenes to extend the remodeling effect of the core enhancer (28, 29). In the present case the neo gene may behave as a decoy site for factors normally controlling IgH transcription, as demonstrated by the inducibility of the knockin tk promoter. That the neo gene effect varies depending upon its position in the locus also probably indicates that promoter competition mostly happens when neo is inserted in between an enhancer and its target endogenous promoters. In the latter configuration documented in this study, promoter competition insulates Eμ and precludes its activity on immediately adjacent upstream D or rearranged VH promoters so efficiently that it blocks B cell differentiation. We thank Amine Khamlichi and Jenny Cook for critical reading of the manuscript, Mireille Drouet for help with flow cytometry, and Emmanuelle Magnoux for help with sequencing. ↵1 This work was supported by grants from Association pour la Recherche sur le Cancer (Grant 4403), Ligue Nationale contre le Cancer, the SWITCH Network, and Conseil Régional du Limousin. ↵3 Abbreviations used in this paper: MAR, matrix-associated region; BCR, B cell receptor; ES, embryonic stem; LCR, locus control region; neo, neomycin; tk, thymidine kinase; wt, wild type.